Respondents could select as many as appropriate. 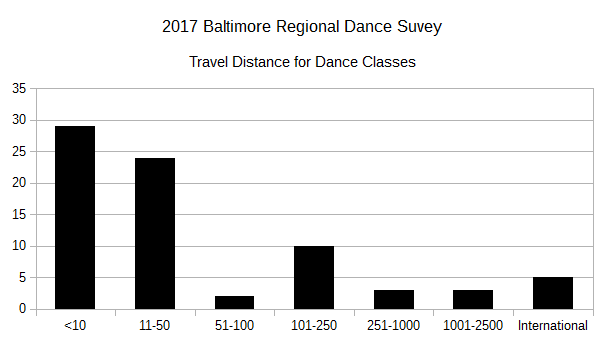 Some bias is introduced by providing sample destinations, but I figured that was less troublesome than asking each person to decide if New York City fit in the 101-250 mile range or in the 251-1000 mile range (because it depends on which part of Baltimore Metro and which part of New York City metro you connect…). 55 Respondents made it through this question. 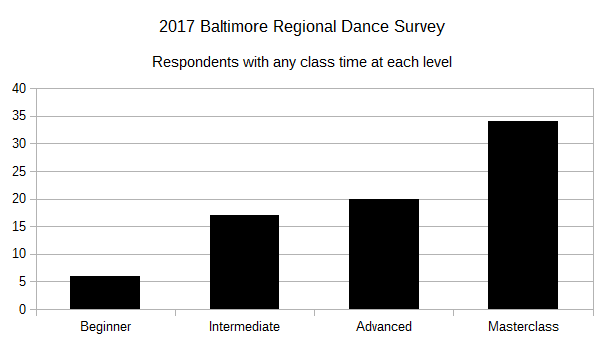 No surprise, given the opinion that there are quality dance instructors in the Baltimore Region, the majority of respondents took classes in the less-than-10-mile range. Economically, the next (11-50 mile range) is also quite understandable, and the common trip to New York shows up in the 101-250 mile option. 34 Respondents spent some time in Masterclasses during 2016, and we have 21 respondents traveling 101 miles or more for classes. That seems reasonable.